Are you looking for the PERFECT End of the Year gift for your secondary students that is meaningful and won't break the bank? These note cards are just the solution you are looking for. There are 4 different banner designs with an inspirational message on one side and blank side. In addition, there are two different sizes available for each banner. All you have to do is print and cut out these banners to begin creating your End of the Year gifts! • Option #1: Write a short personal note to your students on the back of each banner. 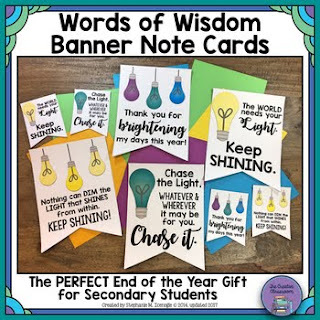 • Option #2: Use the larger banners and allow students to write their own notes or words of wisdom on their classmates banners. This will be a keepsake for each student that contains a personal note from you and their classmates. Be sure to read the entire product description and download the product preview to see exactly what you are getting when you purchase this product!